As entrepreneurs, we all want to predict the future. Wouldn't it be great to know the next big thing? Or what's going to grab your market's attention? After that, the key question becomes how to capitalize on this insight. Trend management tools not only give you insight into the future, they also help you plan for the future. As entrepreneurs, we all want to predict the future. Wouldn't it be great to know the next big thing? Or what's going to grab your market's attention? After that, the key question becomes how to capitalize on this insight. Trend management tools not only give you insight into the future, they also help you plan for the future. 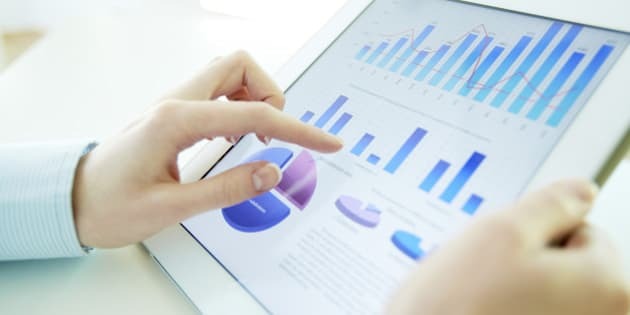 Understanding trends empowers you to leverage every growth opportunity and each moment your competition might be missing. Trends help you prepare for downturns. Knowing about a market slump in advance lets you better prepare for it. Trends give you insight into how often people search for your brand vs competitors, so you can understand the lows and highs of the competition and plan accordingly. Trends provide insight into your industry overall. If you're just starting a business, this helps you enter the market strategically. If you're up and running, it enables you to tailor content to your market. Imagine you are a headphones company and want to capitalize on peak interest throughout the year. 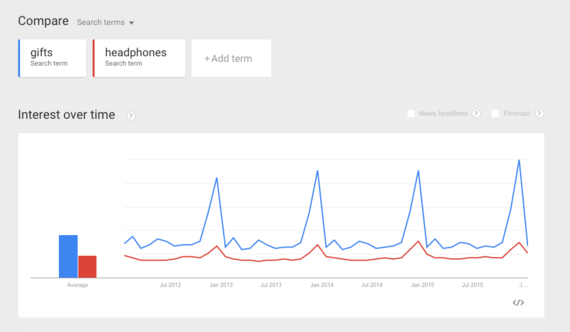 Google Trends shows you a year over year trend for the term "gifts" and a similar trend for "headphones", co-occuring during the December/January holiday period. 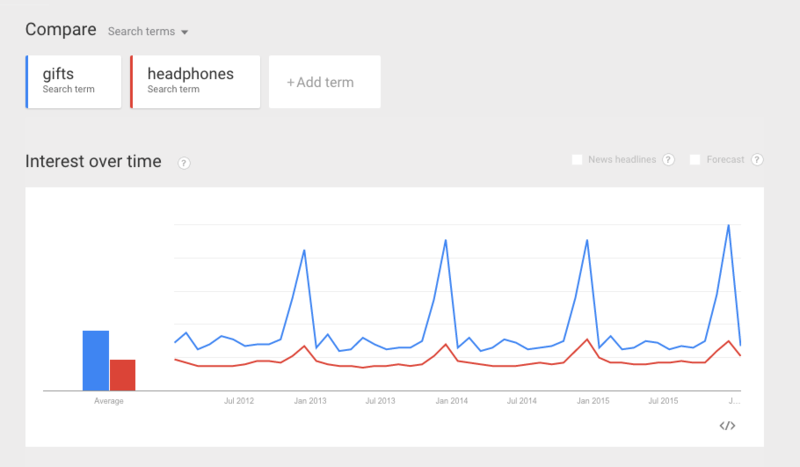 What about the periods with a spike only for "gifts", not "headphones"? Seems there are opportunities around Valentine's Day, Father's Day and Mother's Day! You can now capitalize on an untapped market trend. An example could be, "An Unconventional Gift for an Unconventional Dad". Start typing in Google. What do you see? A bunch of autocomplete suggestions and related topics. Helpful when you're looking for something.... SUPER helpful to know what others are looking for! You are a real estate startup running out of blog ideas. You need to fill up your editorial calendar. 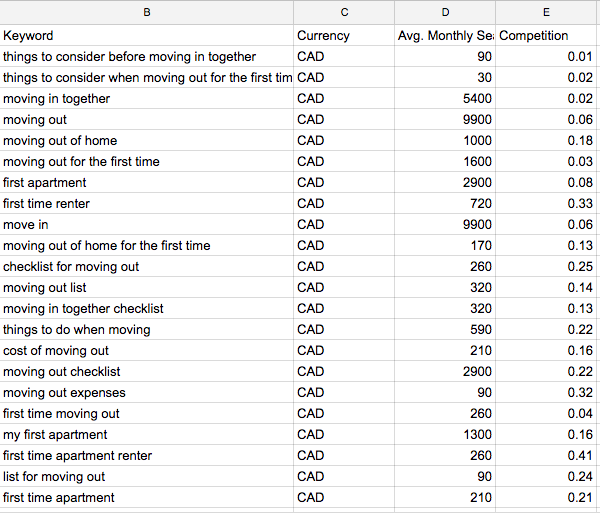 Type "5 things to consider before moving out" into Google. It's a broad topic and hard to rank on for SEO, but related topics have more potential. It's a ready-made list of related topics to write about! Yet another ready-made list to inspire blog posts, articles, newsletters and much more. What? Adwords aren't free! No, you have to pay for ads. 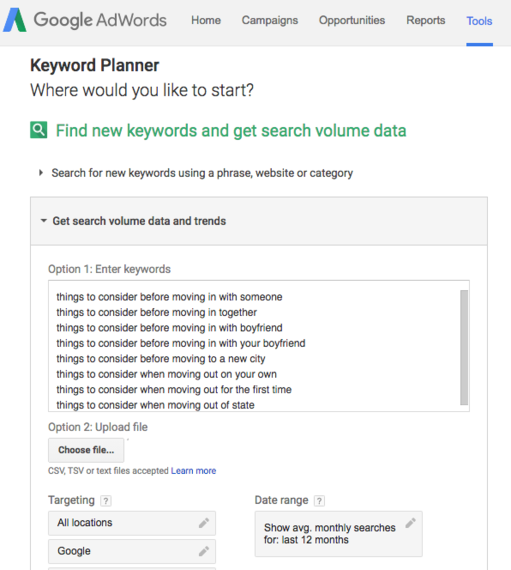 But an Adwords account is free and comes with the handy (and free) Keyword Tool, which finds related trends and measures their search volume. 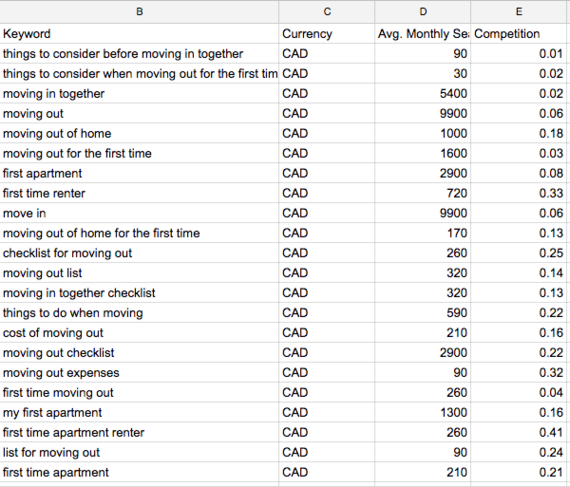 Using terms from our real estate example, you can see the first four topics are most worth writing about, based on average monthly searches. But take a look at the second column - Competition. Rows 2 and 4 are extremely relevant to your business and have low competition. These are two great trends to write about! Now you want to find more related topics. 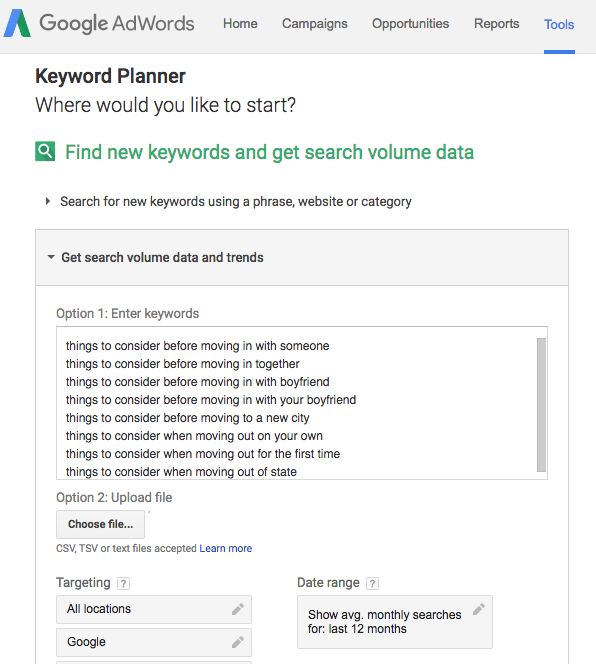 Still using Keyword Tool, use the option to search for new keywords using phrase, website or category. You now have 380 keywords, for which you know the volume and competition. As you build or grow your business, keep these tools in your toolkit. Use them when planning promotions, email campaigns, blog posts or any marketing content. They will give your business a serious edge.